The Tomb of Khwaja Muin-ud-Din Chishti (Khoja Sayyid), Ajmer. bl.uk > Online Gallery Home	> Online exhibitions	> Asia, Pacific and Africa Collections	> The Tomb of Khwaja Muin-ud-Din Chishti (Khoja Sayyid), Ajmer. 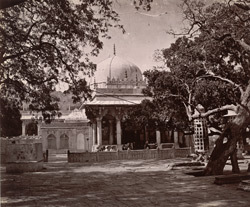 Photograph of the Tomb of Khwaja Muin-ud-Din Chishti, Ajmer, taken by O.S.Baudesson in the 1880s, from the Archaeological Survey of India Collections. Muin-ud-Din Chisti (1143-1235) was a Persian Sufi saint who came to Ajmer in 1192. After his death a dargah (a Muslim shrine or tomb) was erected in the south-west corner of the city by Iltutmish (r.1211-1236), Sultan of Delhi, and later enlarged by the Mughal Emperor Humayan (r.1530-40; r.1555-56). Further renovations and additions were made by his successors. The tomb is a square white marble structure with a domed roof and two entrances, one with a silver arch. It stands in the centre of an inner court of the dargah complex, which also contains two white marble mosques and an assembly hall for the poor. The entrance to the complex is a high white gateway, shown in the distance in this view. The dargah has remains a place of pilgrimage for both Muslims and Hindus and is now considered the second holiest Muslim site after Mecca.